One of the biggest considerations when learning how to grow basil is knowing when to plant the seedlings outdoors. The time to plant depends on the soil temperature. So in general you are looking at a soil temperature of around 18 C plus. In Melbourne this may not be until November, in Sydney maybe October. Even then it will depend on the year and the area you live in. In the hills and highland areas it will be later than in lower and warmer areas. 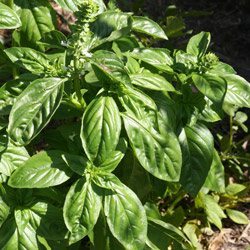 If you have never grown your own Basil, and only used the stuff from shops, try growing it at least once, you will be amazed at the difference in taste between ‘fresh basil’ and ‘not so fresh’. Basil grows well in a humus rich moist soil, we suggest some shade in afternoon, seems to keep it a little ‘sweeter’, and tends to stop it from going to seed (bolting). You can plant seedlings in late spring to summer. To get a head start you can start growing seeds a little earlier in a cold frame or greenhouse. You can even grow plants in a greenhouse during cooler months. Darwin – Germinate and Plant at just about any time of the year. Growing Basil in the Kitchen Garden, Pots and Containers. Basil Plants love a humus or compost rich moist soil, they does not like to dry out. Plant once the risk of frost or cold spells is over. The WET POT watering system is ideal for basil as it provides the roots with the moisture it requires. Choose a sunny position in the garden however protection from the hot afternoon sun in hot periods is advisable, and remember it does not like to dry out. If you are growing basil plants in pots or containers make sure that you use a good quality potting mix and fertilize with a liquid seaweed fertilizer. This is a plant that is at its best when continuously picked as this helps prevent flowering and will increase yield. The easiest way to grow basil is from seedlings. Choose a position in part shade. A humus rich moist soil is essential. Prepare the soil by digging in well rotted compost, some cow manure and some blood and bone. Seedlings should not be planted out until after the last frosts, and even then wait for the soil to warm a little. Seedlings need to be planted on a cool day. Basil needs to be kept moist through the growing season. You can plant basil around tomato plants, they will get a little shade and these plants grow well together. Harvest basil before the leaves become to large, they taste best at this stage. You can cut back to a pair of leaves and the plants will reshoot. As a companion plant for tomatoes basil is excellent, the tomato plant will provide a little shade. One of the most widely used culinary herbs the main two types or varieties found growing in most vegetable gardens being Ocimum basilicum known as ‘Sweet’ or ‘Italian’ Basil and Ocimum obovatum or Greek Basil. The purple variety or Ocimum basilicum ‘Purpureum’ is readily available and Perennial Basil (Ocimum americanum) can also be found. 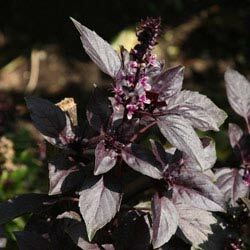 From India we have ‘Sacred Basil’ or Ocimum tenuifolim. Varieties include : Cinnamon, Fino verde, Genovese giant, Greek (yiotis) Lemon, Lime, Mammoth, Napolitano, Opal and Purple ruffles all have their special uses. We use fino verde, genovese or napolitano for making pesto. (see recipe below). Pick regularly to prevent flowering. Blend all of the dry ingredients in a food processor adding olive oil until you get a creamy mixture. Add Pesto and ‘hey presto’ a magic meal. We use fettuccine, and stir the pesto mixture through the fettuccine (sometimes tagliatelle) until the strands are coated and then serve. Finely diced tomato makes a great addition as does avocado and maybe some extra freshly ground black pepper.